Size of the Industry 100 manufacturers in India for Granites and there are also a few trading companies. Geographical distribution Tamil Nadu, Andhra Pradesh, Karnataka, Maharashtra, Assam, Bihar, Rajasthan, Odisha, Meghalaya and Madhya Pradesh. Output per annum The total industry size is estimated to be approximately US $ 85 million. Market Capitalization An average container has a price of US$ 18000 to US$ 24000, depending on the materials used and the complexity of the designs, thus the total industry size is estimated to be approximately US $ 85 million. India is one among the leading countries in mining and export of granite and is rich in granite reserves. Geologically, the southern and eastern belts of the Nation are abundant in granite deposits. Different shades of granites are available in abundance in Tamil Nadu, Andhra Pradesh, Karnataka, Maharashtra, Assam, Bihar, Rajasthan, Odisha, Meghalaya and Madhya Pradesh. Indian Granite Stone has become the most sought-after and extensively used stone material in building construction and massive structural works throughout the world, and it is well known in the International market, not only for its elegance and aesthetic quality, but also for its durability. The Granite Industry has received a wider publicity and corporate importance in the last few years. The industry is emerging now as a thrust-export-area with several corporate houses, supported by expert professionals trained in all aspects, entering the sector with sophisticated world-class machinery and making it an organized one. Many overseas buyers, including the Japanese, are the regular importers of the Jet Black Material, which is considered to be the world's best variety and is found in abundance in Tamil Nadu, Andhra Pradesh and Karnataka. Bu they have, of late, lost confidence in the supply of materials owing to its interrupted schedule. This was because of inconsistent policies of the Governments towards the industry, together with political interference in mining lease and other procedures. 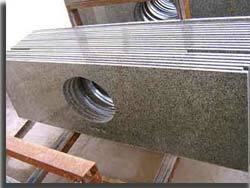 India is one of the leading nations in the production and export of Granite and other stones. Granite is a very hard crystalline, igneous or metamorphic rock primarily composed of feldspar, quartz and lesser amounts of dark minerals. India has vast resources of granite with about 110 varieties of different colours and textures such as black, grey, pink, multi coloured, etc. 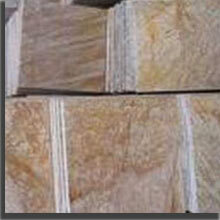 These varieties are used to produce monuments, building slabs, titles, surface plates etc. However, popular varieties are mainly found in South India. Granite in the form of slabs and tiles has several attractive features, which, inter alia, includes extra-fine mirror-polish, scratch-free glossy surface and durability. Granite can be compared very well with other floor and wall application materials such as ceramics and marble. Mining for granite is done manually. For drilling and channeling hand chisels and hammers are used. There are very few quarries that have mining machinery, such as compressors and drilling machines for drilling and blasting, cranes for lifting big blocks, and dampers and trucks for transport. Granites are now mined in most of the Indian states for use as construction material and road metal but production of dressed granite blocks and slabs from Andhra Pradesh, Karnataka, Rajasthan and Tamil Nadu are highly priced. In India there are 43 granite processing units of which 12 are in Andhra Pradesh, 13 in Karnataka, 3 in Rajasthan, 14 in Tamil Nadu and 1 in Odisha. During the last five years exports have grown steadily by about 10% a year but this growth rate may increase even more in the near future. New companies may not be entering the industry but many existing companies are steadily increasing their production capacity to meet demand. New technology investments are being made with the aim of increasing sales and reducing costs. In the last few years CNC machines have been employed in many factories for making complicated designs. Usually the diamond tools and other consumables are imported, to the extent of 80% of total demand, and amounting to between 5 and 6 million US dollars per year. There are 100 manufacturers in India for Granites and there are also a few trading companies. In the last 5 years the capacity of these companies has increased by about 10% annually, suggesting a certain stability and sustainability. Big companies are considered to be those that have the capacity of manufacturing seven or more containers per month- and there are about 20 such companies. On an average about 75 workers are employed in a company. Total the direct employment in the Indian Granite industry is about 10000 people. Indirect employment comes to another 10000 people. About 80% of the manufacturers are located in the state of Tamil Nadu while the rest are located in the neighbouring states of Karnataka and Andhra Pradesh. The entire gravestone industry is located in the south of the country which is where most of the granite quarries are to be found. Total Granite production in the Indian industry is estimated to be about 350 to 400 containers a month. (A curious unit - when referring to blocks the normal term used is cubic metres, in slabs, the measurement unit is square metres or square feet, while in the gravestones the reference point tends to be containers). As mentioned before, the entire production is exported. Presently about 180 to 200 containers are exported to Europe, approximately 50 containers a month are exported to United States, 40 containers to Japan while the rest are sent to Australia, New Zealand, South Africa and other countries. The months of November, December and most of January are considered to be the low season when monthly production drops to about half. An average container has a price of US$ 18000 to US$ 24000, depending on the materials used and the complexity of the designs, thus the total industry size is estimated to be approximately US $ 85 million. Granite importing countries such as the US, China, Italy have reduced their requirements. India's granite and natural stone exports could be down by 15-20 per cent per year according to CAPEXIL (formerly Chemicals & Allied Products Export Promotion Council). India has one of the largest reserves of granite in the world and exported Rs 2,600 crore (Rs 26 billion) worth of the stone in the past years. Granite exports this fiscal are expected to touch Rs 2,800 crore (Rs 28 billion) and nearly one-fourth of these exports is accounted for by monument stones. About 85-90 % of the total granite production in the country is for exports. So after the recession period is over the industry will again regain its demand .This is the best time for an entrepreneur to venture into this sector. Last fiscal, the total exports of granite and marble from India had crossed the Rs 4,000 crore marks with the US accounting for the bulk of the consumption (40%). The All India Granite and Stones Association (AIGSA), which estimated a 10 % increase in overseas sales for 2007-08, found the export market no more lucrative. The granite industry in Rajasthan has been growing at 50% annually. But this growth has serious social and environmental costs. As the water sources are being depleted, forcing farmers to become laborers in the granite industry. Rajasthan Granite mining is an approximately Rs 800 crore industry today; it forms 95% of India's dimension stone exports.